I’m really pleased to welcome Virgina King back to Portobello Book Blog. Virginia’s latest novel in the Selkie Moon series, The Third Note, was published as an e-book on 22nd March and you can order it online here. She has written a really intriguing post for me today about treating ideas for novels like ghosts! “An idea, like a ghost, must be spoken to a little before it will explain itself.” Readers often ask where writers get their ideas and I love this quote from Dickens because I’ve found that ideas really do need to be treated like ghosts. Ideas turn up out of the blue. Ideas creep up on me when I’m doing other things. They wake me up in the middle of the night and demand a fresh look at something I’ve written during the day. Their appearance can be unexpected and their purpose obscure. Just like ghosts. An idea can be shocking. Just like an apparition, an idea can shock the writer. Ideas put dialogue into the mouths of my characters and send conversations off in reckless directions. Or they drop something like an object into the story it starts behaving like a poltergeist in the plot. To understand the ghost, don’t run away. Similarly, a writer shouldn’t dismiss an idea that doesn’t immediately make sense. I let mine stay filmy and they hang around moaning, until I figure out what they mean. This gives the writing a dynamic edge – I never know when the next spectre is going to drop by and leave a calling card. Living with a ghost requires courage and patience. Ideas can turn up and refuse to go. I need the same qualities to deal with a mind that’s brimming with ideas. I don’t call in the exorcist – I just have a notebook for every room and tote bag, and I apply the utmost patience to even the most bizarre idea. Engaging with a ghost can produce an unknowable outcome. It’s the same with ideas. When those ghosts of ideas take up residence and refuse to go I engage with them from a position of curiosity and they take me deeper into the story. The mysteries in the Selkie Moon series find their layers in the ghostly ideas that turn up as I write. The series is now a trilogy (+ prequel making it a four-book trilogy). 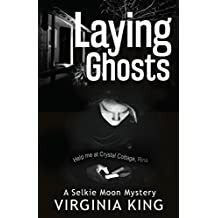 You can sample the series for FREE by downloading the prequel Laying Ghosts, a 60-minute adrenaline rush and a great example of ideas turning into real ghosts. When Selkie Moon receives a parcel from her great grandmother 35 years after her death, the contents needed to carry a message. The word ‘murder’ popped into my head in chapter one and I had to write the book to find out what it meant. A Shona sculpture turned up like a ghost in The First Lie. Selkie Moon picked it up at a market and loves its crude beauty. Little did I know that it would have a symbolic role in the story, including the final dramatic scene.